Another very successful month of adoptions saw our adorable and charming BB brothers, Bertie and Beenie set off to the UK, gorgeous Lana (Banana), and the beautiful three Puppy sisters, Darcy, Sally and Betty all went to Germany, Marinas special little sweetheart Max (formally Geatena) went to Holland, and puppies Monalisa, Bella and a very lucky kitten (who spent less than one day at the ARK!) were adopted in Kefalonia. We are so grateful to all of those involved in the transporting and rehoming of our animals, and in particular to the families that have offered them such a great new life! Bertie and Beenie together with ARK volunteer Madeline, Lana, the girl with the most beautiful eyes on the island, and Max, after a fun days play in the rain! This month Marian and Danny from Holland came to ARK to volunteer with us for 2 weeks. 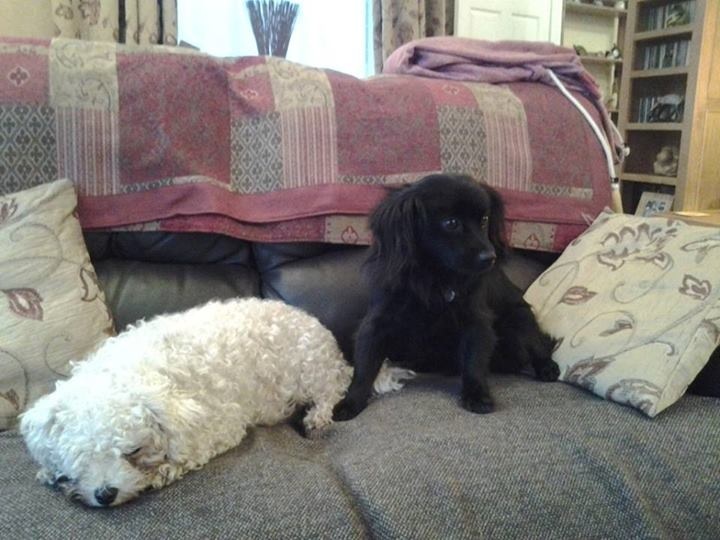 They both did a wonderful job of helping us to take care of the animals, and also worked very hard on helping us to raise much needed funds and support, all of which was so greatly appreciated by both us and the animals. Since returning to Holland they have been actively looking at ways to further support ARK and raise awareness, we thank you both so much for your hard work and support, and hope to see you again soon. October saw the arrival of 5 new dogs, all saved from very unpleasant and dangerous situations, 1 kitten who was brought in by some visiting tourists, one puppy who was left overnight at the shelter gates in a box, and a further four puppies brought in by tourists who found them wandering across a main road in Argostoli being dodged by passing cars! It is the aim of ARK to try to keep the numbers down as much as possible, but equally we are not able to turn our backs on the neediest of animals we are faced with, and do our best to care for them all. The lovely kitties of ARK were treated this month, when their pen was completely emptied, thoroughly cleaned, and refreshed with new stones, cushions, blankets and bedding. It took a full day to complete, but a job that was in desperate need of doing, and the cats were very happy when they were released in to a clean and fresh pen, with comfy warm new beds, just in time for the winter. Preparing for winter - Please help! Although we are still lucky to be feeling the warmth of the summer sun, at ARK we are already preparing for the wet and colder months ahead. We currentley have no weatherproof storage area to keep food, blankets, medications, or any other essential supplies, and are hoping to raise funding to enable us to create a unit for this. However we would still be very grateful for any much needed winter supplies such as old clothing, bedding, towels or blankets to keep our animals warm during the cold season, and any donations for food (or better still food brought directly to the shelter), now that we are without the incredibly kind support of our visitors during the holiday season. Any help that you can offer the shelter is greatly appreciated, thank you. Thank you for following our news, and we will be back with more news soon. It's been another very successful month for adoptions, this time we said goodbye to 3 puppies, Emma, Trixie, and Zeus, our gorgeous boys Bobby and Bruno, and two of our funniest girls Kitty (the resident kangaroo) and Tilly, who after over a year in the shelter have finally been given their golden opportunity. All of these dogs were rehomed in Germany and Austria, and a further 3 dogs were rehomed here in Kefalonia. And it was a very special day when two of our adorable CATS were adopted!!!! something that happens so rarely at ARK. As with every goodbye, the shelter always feels something is missing once they go, but the joy and happiness we feel once we receive the wonderful photos and news of our animals flourishing in their great new lives, makes every moment of what we do absolutely worth it. With great thanks to the Adopted families (and everyone involved in the rehoming process) for giving these animals the chance they so deserve. 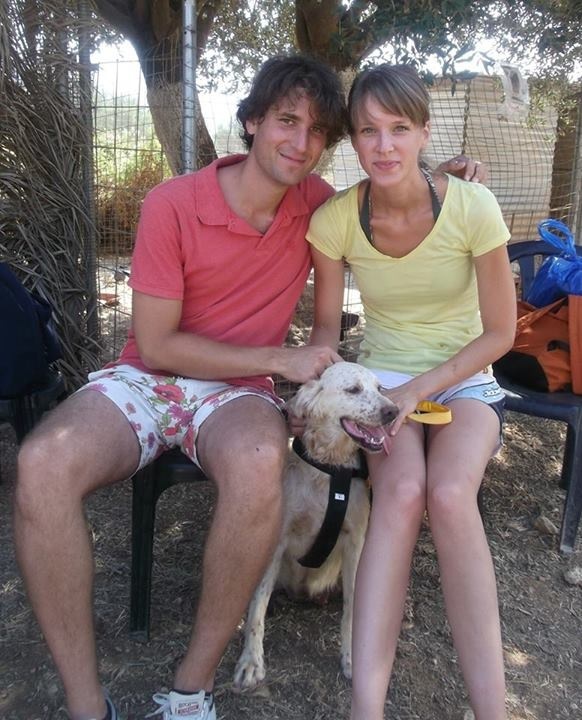 We were very lucky this month to receive 2 new wonderful volunteers that came to Kefalonia only to help us and our animals. SIMONE from Holland, and HILDE from Belgium both did such a fantastic job at the shelter, they worked so hard and the animals loved them, as did we all. We THANK YOU so much for helping us with all that we do, and we hope to see you both again very soon!! 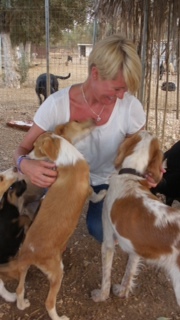 We also welcomed a lovely new local volunteer Alarnis, who is living in Kefalonia with her family (from England), and who visits the shelter regularly to help us caring for the animals. Alarnis and her family have been so kind and supportive, and we are very grateful for their support. As mentioned in last months newsletter, the ARK is now full and we are not at present able to accept any new arrivals. That is unless, we are given no choice as we often find we aren't. This month we were presented with 3 new puppies, one that was found alone running loose at the back of the property, and another two discovered on the road just outside the shelter. Another new arrival is a lovely young boy named 'Bingo', who was found in the early evening tied to the entrance gate with a rope. So although the numbers are improving with our successful adoptions, they increase again sometimes just minutes later without any warning. 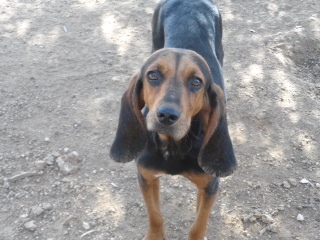 Bingo, the sweetest little boy with possibly the biggest ears in ARK! Some stray dogs are lucky enough to capture the heart of a kind and caring passer by, in the case of Pipi she was special enough to capture the hearts of 3. 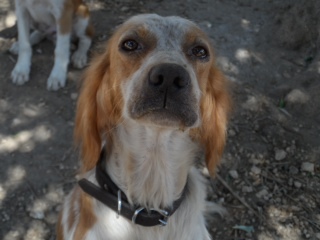 We were first alerted to the story of Pipi, a helpless and starved young Brittany, when she was spotted by a visitor from Finland named Mari. 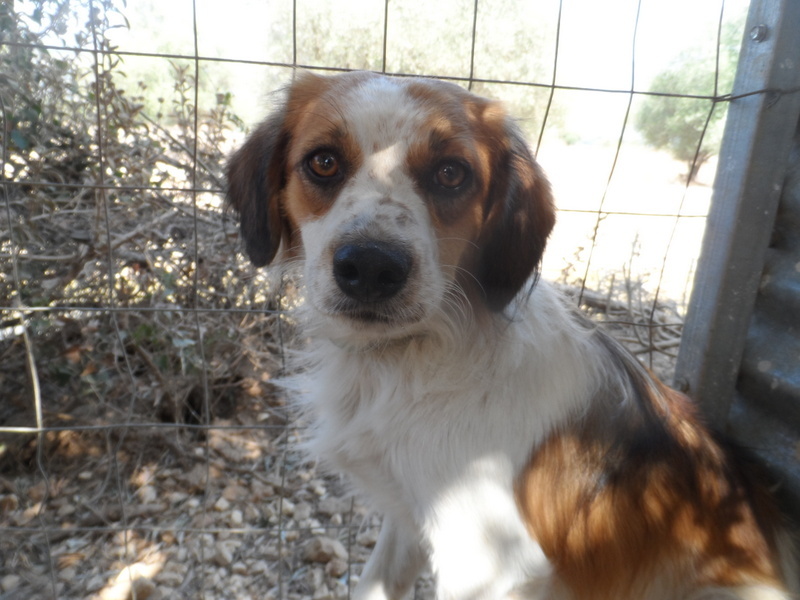 Three days later we were contacted by a couple visiting from Athens who had also fallen for Pipi and had taken her in to their holiday villa as they were warned by a local she was in danger of being killed due to her love for the local chickens that caught her hungry eye! When Pipi arrived at the ARK, it was clear she was unusually thin, and a blood test confirmed our fears, that she is Leischmania positive. But Pipi's luck was on her side yet again, as Mari from Finland so very generously offered to cover all costs for Pipi to receive the treatment required to make her well again. Pipi is now on daily medications for her condition, and is already showing great improvement. We (and Pipi especially) are incredibly grateful to Mari for showing such great love and compassion for Pipi, and for her great support in the work that ARK is doing, THANK YOU Mari! As the holiday season draws to a close, we will really miss the many visitors holidaying on the island that have shown us so much kindness, generosity and support. Rarely a day passed by without an international visitor taking time out from their holiday to visit us and spend time both with us and our animals. It is extremely touching to see that there are so many people from outside of Kefalonia that are truly concerned and keen to help us with the stray and abandoned animals we are caring for, and we hope to see many of them again next year. Without this kind of support we don't know how we would have survived, and on days when the food supply was down and funds were low, along came our saviours that sometimes literally saved the day. We are truly grateful for all of your kindness, THANK YOU!! We were all filled with great happiness to witness some of our much loved dogs set off for their new homes, often involving very long and tiring journeys, but all worth it when they discovered a loving family and wonderful new life ahead. Two of our puppies, Kappa and Thita, and fun loving Libbie are all rehomed in Austria, sweet little Simon in Germany, and our darling Becka is now living in Holland. 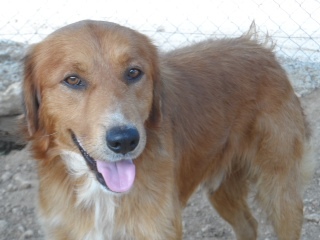 We've also had another 5 dogs adopted from families here in Kefalonia. We wish them all a truly happy and wonderful life, and give great thanks to their adopted families for giving them this great chance. Shortly after Bobby arrived, we were visited by some very kind and caring people from the UK. They spent a couple of hours visiting with all our animals, and taking time to speak with us about our situation, and were kind enough to offer help in any way they could. After saying our goodbyes and wishing them an enjoyable holiday, we were surprised when they returned but one moment later, to say they had fallen in love with little Bobby, and were going to adopt him then and there!! This kind of thing doesn't happen often at our shelter, but when it does you know it was just meant to be. Bobby jumped straight in to the arms of his loving new family, and off they went to Bobby's temporary foster home where he will stay until he is prepared and ready to make his way to the UK. We give great thanks to Bobby's new forever family, for making Bobby's 'Lucky day', and for giving him this great chance. We have been very fortunate to receive help from international volunteers this month, first came Eva and her daughter from Germany, and now Melissa from England. Both Eva and Melissa have spent at least a month at a time helping us to care for our animals, and both have continued to return numerous occasions after seeing just how much help is needed at the shelter. Thank you Eva and Melissa for your continued support. It was late one afternoon when all of a sudden the shelter turned in to chaos in a matter of seconds. 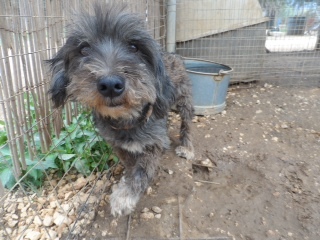 A very small puppy who was unknown to us at the time, was running loose through the shelter screaming with fear. 'Where on earth has this puppy come from?' we asked ourselves, the answer soon became clear. As we scrambled through the thorn bushes to catch the little puppy who by this time had run outside again, completely terrified of us, we then noticed a second puppy running loose along the road beside the shelter. And as we ran between two of our dog pens to catch the second puppy, we discovered a cardboard box containing 5 more puppies, which had been dumped in broad daylight while we were busily working to care for our animals. It is impossible to imagine who could do such a cruel and heartless act, to abandon these poor terrified animals without a single care or thought. So in just a matter of seconds, we now have 7 more mouths to feed, on top of the many we were already working tirelessly to cope with! Dogs and cats are animals we are very used to dealing with at ARK, but this month we had a rare new arrival, a large and feisty snake! We were alerted to the arrival of the snake by one of our dogs who came very close to being bitten by the angry hissing creature. 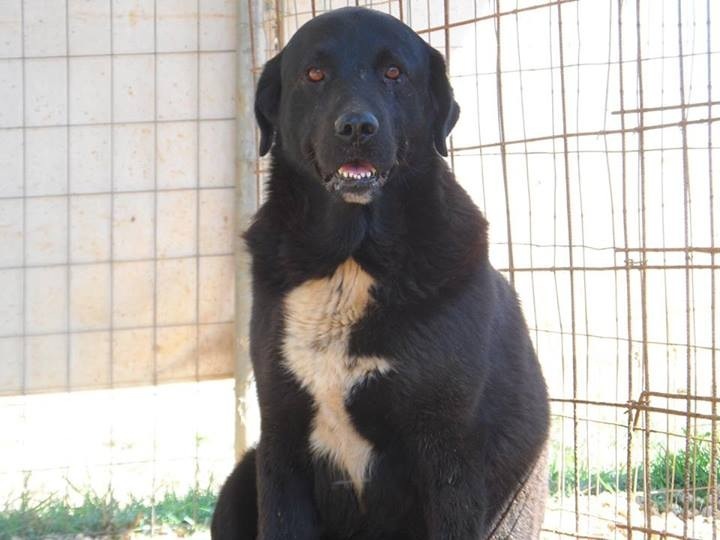 The snake then made his way in to the kennel of one of our very large but nervous dogs, Baluko. Baluko is a favorite of our volunteer Melissa, who is one of the few people Baluko is comfortable around. Melissa and Marina together managed to safely remove big Baluko from his kennel, meanwhile help arrived to safely remove the snake from under Balukos bed, and everyone came away unharmed. After a very scary experience with a very dangerous creature, Marina's thoughts turned to Baluko who she believed may have actually liked the snake and may be sad now he is gone. This just confirms all our beliefs, that Marina's compassion for the animals knows no boundaries!!!!!! Baluko may be big, but he is still quite scared of many things, the snake not being one of them!! As well as the 7 puppies that were left between the dog pens in a box, we've seen the arrival of another 5 dogs, all of which were accepted due to exceptional reasons, but at this time, ARK is now not in a position to accept any new animals given the enormous numbers we are caring for. ARK is in greater need than ever of your help. We are now caring for around 350 animals including both the dogs and cats, and more than ever, we really, really do need your help. There are many ways that you could help us, by giving just a little of your time helping at the shelter, by donating just a little of your money each month (or bringing food to us directly if you are local), by fundraising and spreading awareness, by sponsoring an animal, or by offering one of our animals the chance to be a part of your family. Whichever option you can offer us, all help is desperately needed, and very greatly appreciated. This month we have been lucky to receive a lot of support from new friends of ARK, who often appear at the most crucial of moments. Much of this help has come from visiting tourists, kind and caring people who have taken the time out from their holidays to visit our shelter. Everyone who visits seems very impressed with how happy and well cared for our animals are, and are hugely impressed by how much hard work and dedication is given by the few people working at ARK. It is rare a visitor leaves without shedding a tear, and also rare that they leave without committing to help us once the return to their own countries. We are very grateful to receive such warmth and kindness from our international friends, and for all of those that are helping us around the world.